ONE TOUR. SIX AMAZING ZIPLINES. Riding side-by-side with a friend on a tandem zipline? Flying over Pinot Noir vines? Zipping over pine trees and through an archway of companion oaks? Our six ziplines do it all! You will also take a walk on the wild side between our first and second ziplines as you cross a deep canyon along a narrow suspension bridge. 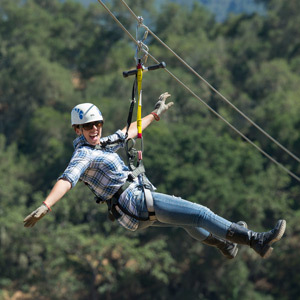 It’s not just ziplines—it’s a guided tour out to the historic Santa Margarita Ranch, with entertaining insights into sustainable winegrowing, local wildlife and more. Total tour time ranges from 2 to 2.5 hours. Keep it comfortable, casual and outdoorsy. Keep it simple with closed-toed shoes suitable for light hiking. Clothing doesn’t need to be tight, but please shy away from flowing attire or jewelry. Bring layers, as temperatures can change during your tour. What are the Health Requirements? Tour guest weight range is between 30 and 275 pounds. Children weighing between 30 and 90 pounds fly tandem with adult family member. Please be prepared to complete two short, moderate-intensity hikes unassisted. If you are pregnant or have other health concerns, please consult your physician prior to ziplining. For additional questions about our tours and policies, please click here.